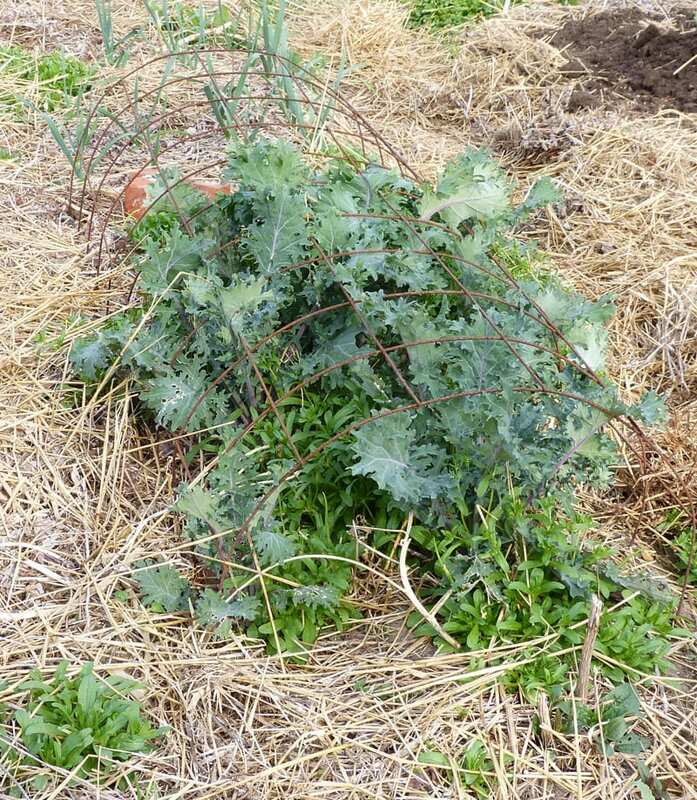 Friend and reader, Betty D, emailed me recently to ask if I ever planted Russian Kale in the fall for winter harvest. And if so, when do I plant. Since I had more answers than Betty had questions, I thought what I’ve experienced with this kale would make a post that might give you some different ideas. Like many folks, I thought of Kale as only being the kind you see in grocery store, or that folks cooked up by the bushel. Whatever the reason may be, it never appealed to me and I never grew it. It was probably early in 2012 when I read somewhere that Russian Kale and and Lacinato Dinosaur Kale (a/ka/ Tuscan kale) where the superior kales. Sounded like a good choice for my “new crops to try” that year; so I ordered. Started the seeds in flats or jugs that year in late winter and as usual succession planted at least 3 times. Lacinato never seemed to like me and after I became enamored with the Russian Kale, I didn’t feel like bothering with the Lacinato anymore. Russian Kale was impressive from the beginning! In early spring it was one of the most beautiful plants in the garden. Growing huge (sometimes more than 5 feet) and enough blue green leaves to feed you all the kale you can eat. Russian Kale on May 1. As you can see it’s starting to bloom. The blue/green leaves are still delicious. The Brassica species of plants include kale, cabbage, broccoli, cauliflower, brussel sprouts, collard greens and a few others. If you grow these plants regularly, I’m sure you’re acquainted with the harlequin bug and the various cabbage worms. Harlequin bugs are in the stinkbug family and brilliantly marked with red, orange and yellow. I’d never been bothered with these pests except for one or two here and there. So I’d had no previous damage by them that I could tell. But with Russian Kale and a few other Brassicas in my garden, harlequin bugs and the worms increased in number with the heat of summer. I didn’t engage my brain! I just went along out habit and pretty much ignored the harlequin bugs (and the worms) as I always had in the past. 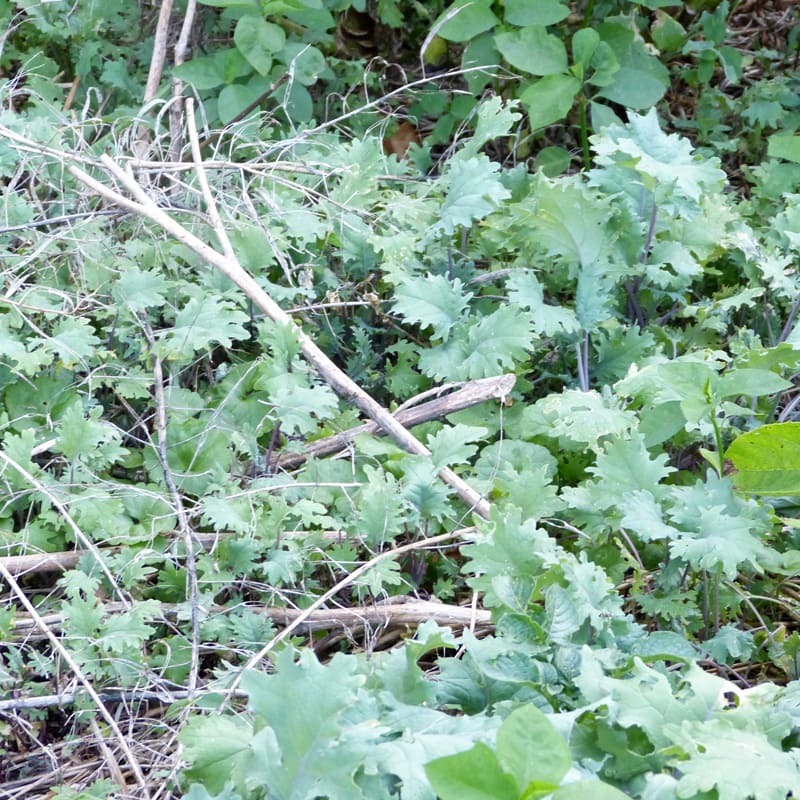 All of a sudden, late in the season, after the bugs had made pretty much of a mess of my kale, my brain started working. I realized this problem was not going to get better until I made these pests part of my daily “search and destroy the bad guys and their eggs” mission. Even though it was late in the season, I start looking and destroying daily. It took me two years to get the numbers down to a manageable number. Last year with Bill being sick I was not able to do a thorough job of search and destroy so I anticipated great numbers of those pests this year. Oddly, they’ve just shown up this year in my garden in the past two weeks. I assume it was the cool spring and early summer that kept them away. They’re defacing some of the older brassicas that I’m allowing to seed, but the numbers are manageable so far. I didn’t see any bugs on the new seedlings, but I saw a tiny bit of damage. Since the numbers are low, my incentive is even stronger to kill as many as I see. Hopefully, they’ll be fewer in number with each passing year. I don’t plant anymore and haven’t since that first year. I just let a plant or two or three reseed. I cut the aged stalks and leave the biomass (seed pods and all) in a path or on a bed in the garden. They reseed there. Russian Kale seedling – July 21 – coming up through cut stalks I laid there. The stalks are tall and if left, they’ll reseed in surrounding beds and paths as well as the bed they’re in. I can move or leave as desired. Patch of seedlings coming up where the parent plant dropped the seed. July 21. I’ve already cut down the “finished” plants from last year. 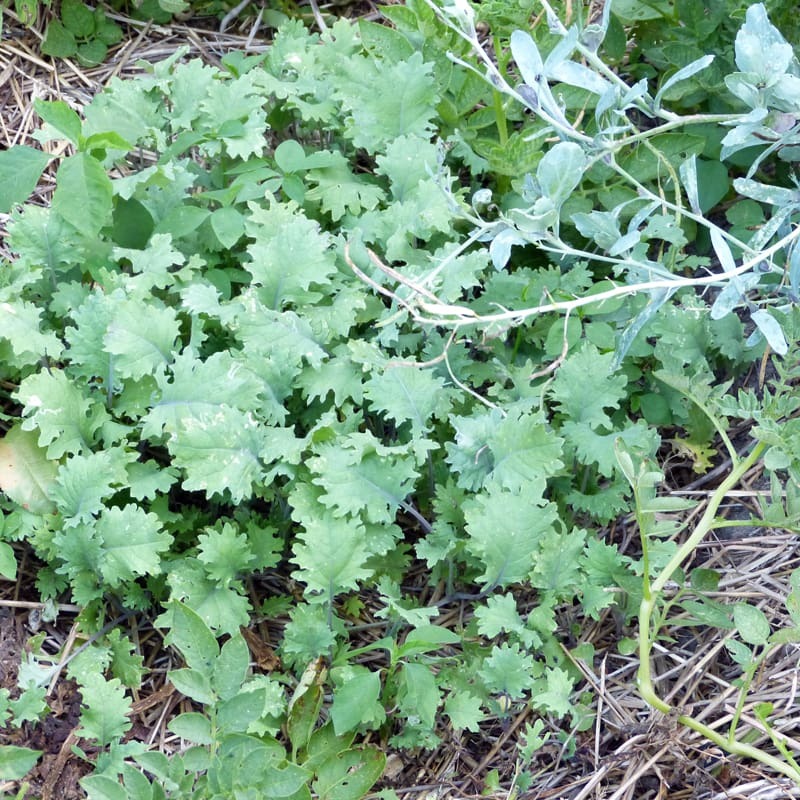 They reseeded and I have new Russian Kale plants coming up in profusion at various places in the garden. Seedlings coming up in other places will be allowed to “fight it out” to see whose the strongest. Those are the ones that’ll be left for this fall and winter and the spring and early summer of 2017. As fall approaches I’ll have more seedlings come up and will take the same approach with them. May 1 – The tallest plants are Russian Kale. They’re starting to bloom and make seed. Leaves are still great. Kale doesn’t need as much protection in my garden as lettuce and such. If it gets and stays really cold (below freezing and especially below 28 degrees), it’s a good idea to be prepared. A note about the wire: When spring comes and Kale resumes quick growth it will grow through the reinforcing wire. 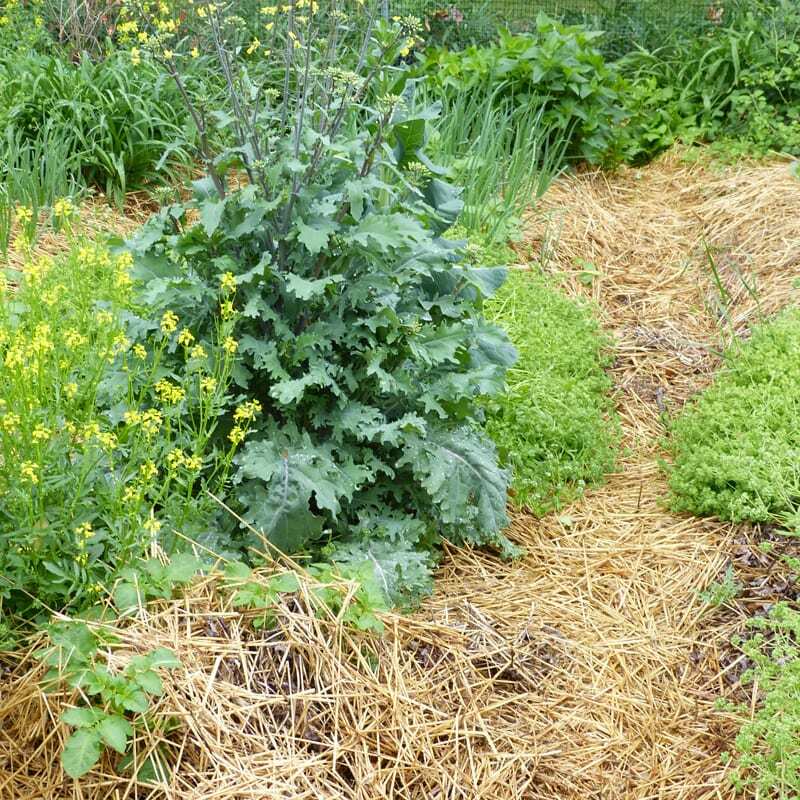 So if you don’t want that to stay in your garden almost all summer, take it up before the kale grows through it. Otherwise, you could pull up your kale when you take the wire up. One of the most nutrient dense foods, a cup of raw kale has all kinds of vitamins and minerals. Vitamin A, K, C, B6, Manganese, Calcium, Copper, Potassium, Magnesium, B1, B2, B3, iron, and phosphorus. 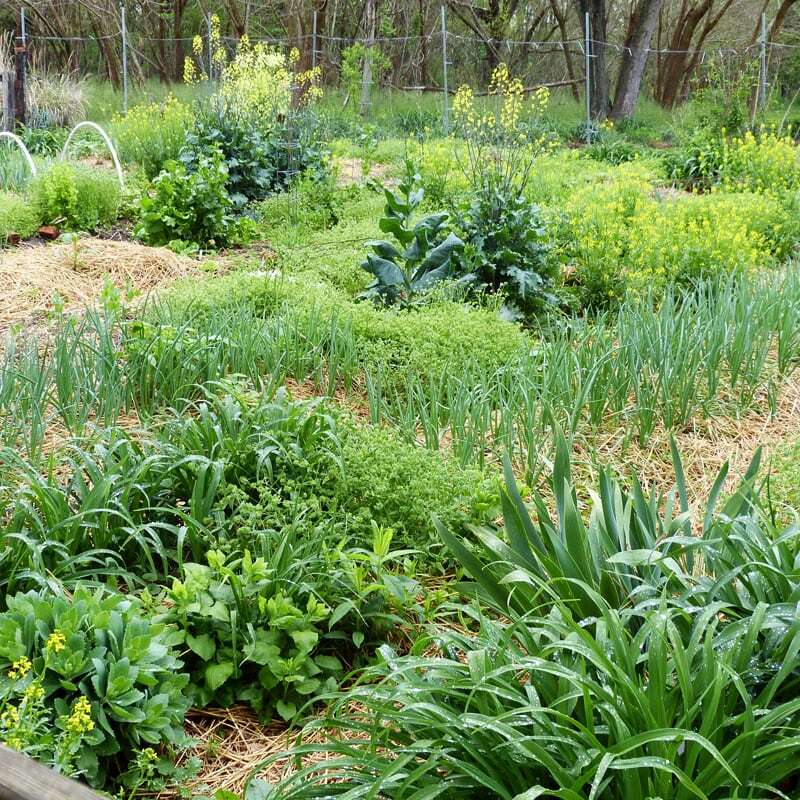 It makes a great addition to the garden, especially since you’ll have it at a time other greens may be in short supply. In the dead of winter and early spring this can be a great boost to your diet. If you use my approach to growing Russian Kale, let me know how you do. Hope you enjoy it as much as I have. Thanks for the kale post! I have a large plant in the garden and I am waiting for it to go to seed–it is riddled with bug holes. I got more than I could eat from just 3 plants this year. It seems like this plant should have gone to seed by now? Will the bug damage keep it from going to seed? I’ve started a few plants on the porch just in case. Usually I only plant this in the fall to avoid the pests and it never gets this big. You’re right, this year the bugs came later. Theresa, I love the reseeding approach. As you know, we have also fought the battle against harlequin bugs. I haven’t grown kale lately for that reason. I did grow cleome this year, which has been a good trap crop for the pests, and I haven’t seen any sign of the harlequins yet. I have Russian kale seedlings ready to move to the garden now. Your report of recent bug sightings gives me pause. I will inspect my trap crop closely this weekend! Betty, the bug damage will not keep it from going to seed. At least the bug damage on mine never has stopped the plant. Pat, I have a post on bugs coming up that I think you’ll find interesting. When you use cleome as a trap crop, you still kill the bugs right? Theresa, I do indeed kill the bugs on the cleome…. AND I am glad I checked this morning. I killed two mating adults and three nymphs on one cleome in the center of my patch. I had only checked the outer plants before today! So I already have two generations out there! I also found one cabbage worm. I will set the kale out at the other end of the garden! Thank you so much for the kale post, and I look forward to the upcoming buggy one! My Kale does well, even in winter, but aphids like to over-winter on it. Now I use it for the chickens, who love the aphid coated leaves- extra protein for them. I make sure it’s gone before spring, so the aphids are gone, too. You’re more than welcome, Theresa! As hot as we’re having it now, I’ll try planting some in Sept/Oct. It is WONDERFUL in my vitamin shake. Also planting more spinach & mustard greens. My spring spinach bolted as soon as it got hot & my mustard got REALLY spicy when it started to bloom! I also tried a,new to me, green that someone had for sale at a local Master Gardener plant sale this Spring called Spinach Mustard. Looks like spinach with some of the spice of mustard & forming a nice round plant that spreads to a nice size. I planted one in an area I hadn’t gotten around to double-digging & the other in a correctly prepared bed. The one in the conventionally prepared spot is just about dead, while the one in the better soil is still putting out new leaves & has put up a flower stalk! I may save a few seeds just to see how it will come back. I have creasy seed I saved & may try some this fall, also as well as more lettuce, green peas & sugar-snap peas. And the list goes on. I got out early today & harvested some peppers, the first few tomatoes & 3 cucumbers. the 2 youngest grandsons are great at spotting the squash-bug eggs. They also helped pick blackberries before it got too hot. I’m going to pick green beans again early tomorrow morning. We’ve eaten some & frozen some from the first picking. Our corn is almost ready to pick. I have several butternut squash on my vines, regular squash/zucchini are blooming, but no female blooms yet, volunteer squash, cucumbers & watermelon are growing & blooming like gangbusters! I’m doing my best to find all of the eggs on my squash plants before they hatch. A few got by me & were all on one leaf & I managed to take care of those. I can’t remember who commented here about watering & disturbing the mulch, but it worked for me this morning! I watched carefully & I was able to kill the only one that came out to see what was happening! Just want to say thanks to them! I hope you have a Blessed evening & a BIG thanks for going beyond just answering my questions. It’s been an exciting spring/summer this year trying new things that you recommended. I grow both Lacinato and Red Russian but the Red Russian is much more prolific. I like the taste of the young Lacinato better, but it gets tough in warm weather. I have sold bags and bags of kale at the farmers market here. Everyone loves how tender it is. I picked it every week so it never got tough. The heat took it out, but I look forward to reseeding again in September. P.S. I became USDA Certified Organic in June and couldn’t be happier! Oh, by the way here is a quinoa update…it grew fabulously and once established, actually became a trap crop for leaf footed bugs! They hung out in the plumes but do not eat it. I killed so many by just picking them off of the quinoa. I am now drying the quinoa completely and hope to have enough to make a few meals. I’d say it was very successful! Congratulations Suzanne on being USDA Certified Organic!!! Big step!! THanks so much for the update on the quinoa AND the leaf footed bug info! VERY interesting. Am anxious to try this Russian Kale as I really do not like any of the kale I have tried. Hope this is THE one. I hope so too MJ. Let me know how you like it.